Request for access to common areas by contractors or for the delivery of large items to your unit. Hopefully, this will allow a more convenient means for our residents to access these documents in order to submit timely to the Board of Directors. Hip-hip Hooray!! 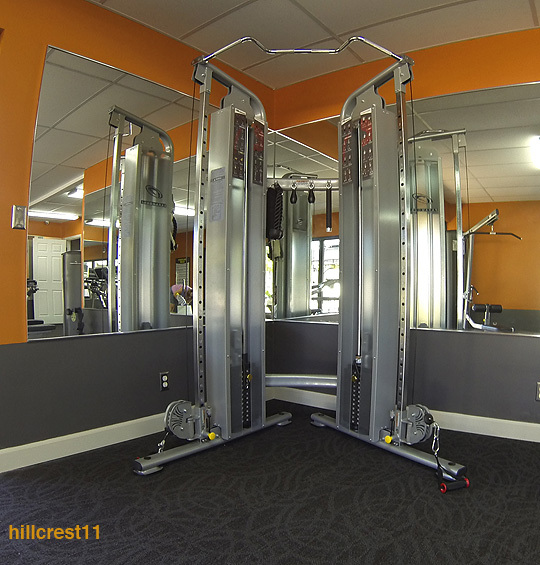 Residents of Hillcrest Buildings 1- 18 are celebrating the opening of their own well-equipped Fitness Center adjacent to Pool #3 on Monday May 11, 2015. Please bring photo ID and proof of residency, either a recent tax or utility bill. Distribution dates for FOB key for pools #1, 2 and 4 will be announced soon. Kudos to the Hillcrest Presidents Council for the work to create this community asset and incentive to promote a healthy lifestyle. Before anyone can use in the new Hillcrest Presidents Council Fitness Center, residents must submit a signed waiver form. Click the blue link below to download a form or collect one from a Council member. The electronic FOB access key you buy for $10.00 to access gym and pool is issued one per unit, if lost a replacement FOB will cost $50.00. 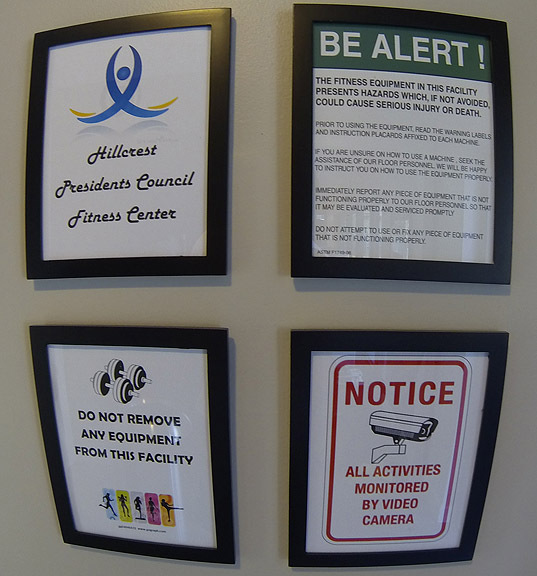 1>> Guests of residents may not use Hillcrest Fitness Center without the res ident present. Only one guest allowed at any one time. 2>> The guest of resident must sign a waiver prior to use. 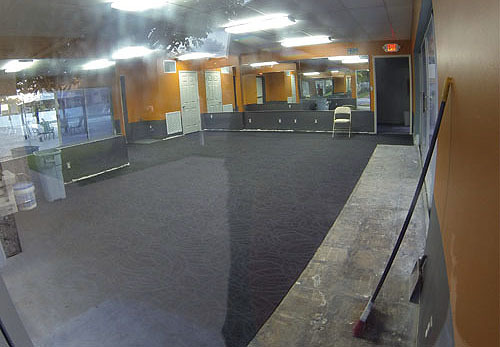 No personal trainers allowed to use the Hillcrest Fitness Center. 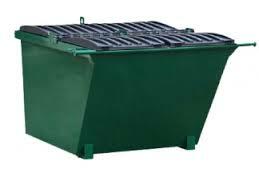 3>> FOB is for use by resident to which it is assigned and cannot be loaned or used by anyone not authorized. 4>> Emergency exits are for emergencies only and not for general egress from or to allow entry to Fitness Center. 5>> Emergency doorway must be clear at all times and not blocked with any equipment. 6>> Residents must wipe down equipment after each use. 7>> No smoking and no pets allowed in Fitness Center. 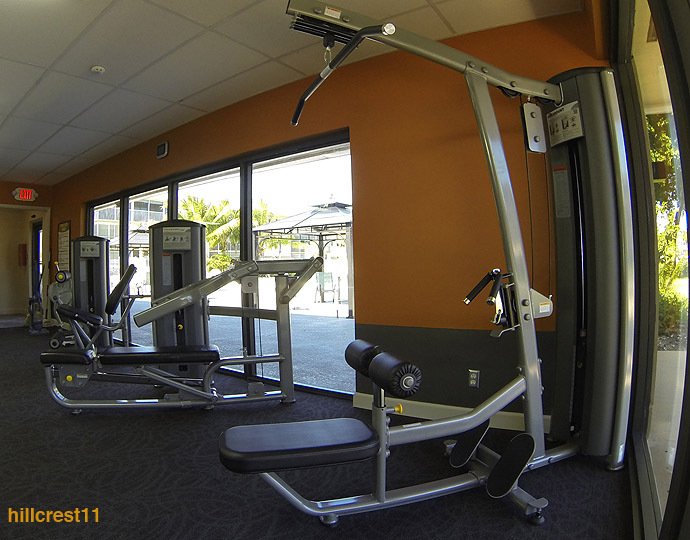 8>> All residents and guests must wear athletic footwear and a shirt when using Fitness Center. 9>> Headphone/earplugs must be worn when using electronic devices (iPods). 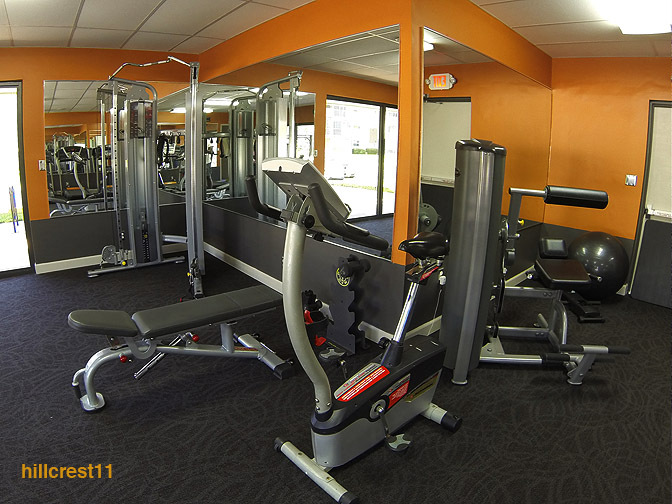 10>> Residents cannot remove equipment from Fitness Center. Your investment in Hillcrest 11, your personal property and safety are now benefiting from an additional security feature introduced by the parking monitoring service recently implemented by unanimous vote of the HOA Board. 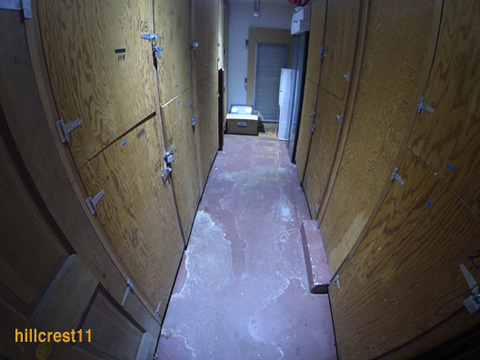 Recently, two units were occupied by people not authorized by the HOA Board to reside on Hillcrest 11 property. Those people brought 4 cars into our already limited parking courtyard. The new parking permits and parking monitoring service, quickly addresses the inconvenience presented by unauthorized vehicles using our parking courtyard. Those vehicles and unauthorized residents are gone, as well as vehicles that were parked at Hillcrest 11 by people in nearby buildings. As of May 1, 2015 the parking courtyard at Hillcrest 11 is monitored by A-Z Parking Enforcement Solutions “AZPES”. 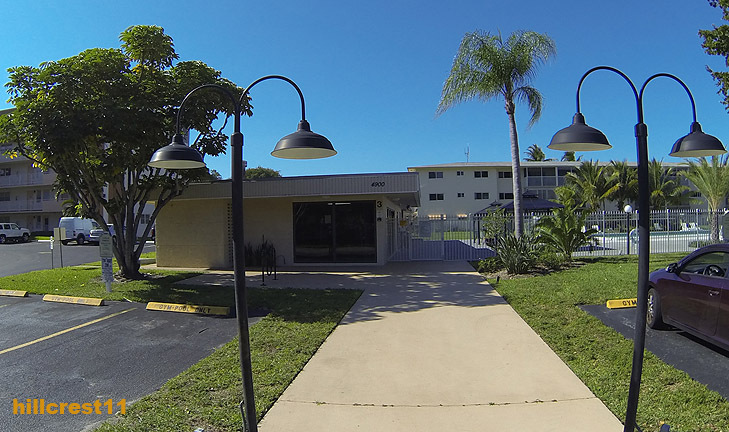 Direct your concerns regarding parking or towing issues to A-Z Parking at (954) 707-8314 or azpes@att.net. 1. No parking on grass, in Fire or travel lanes. 2. Don’t park in “LOADING ZONE” or block dumpster. 3. No parking on sidewalk or in “No Parking” areas. 4. “FOR SALE” sign should not be posted in or on vehicle. 5. No license plate displayed, an expired license plate, temp tag altered or not assigned to vehicle. 7. 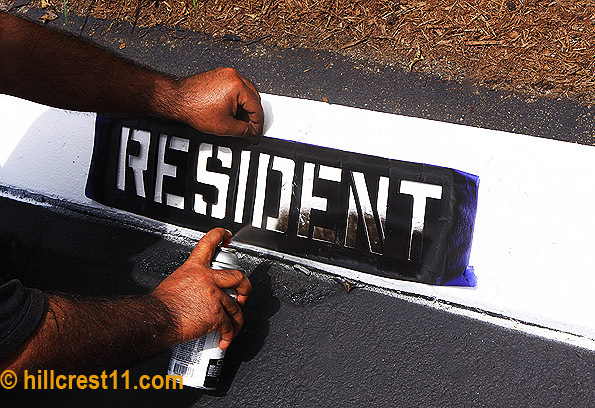 Resident decal required to park in Resident parking areas. 8. Guest Permit required to use guest parking areas over 15 days w ith Board approval. 9. Register with A-Z Parking for guest vehicle parked overnight in GUEST space between 11 pm – 8 am. 10. Residents are not permitted to park in Guest parking spaces; guests are not permitted to park in Resident parking spaces. 11. 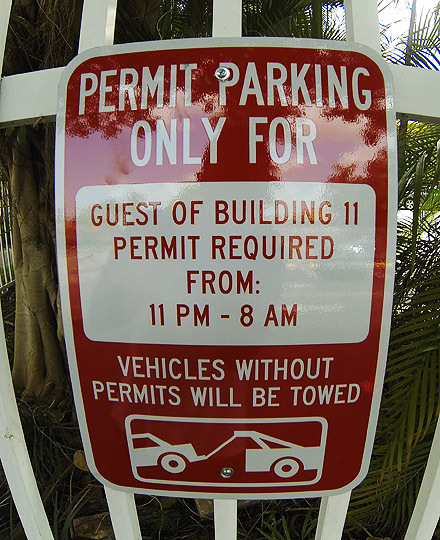 No parking in guest parking without registering guest vehicle. 12. 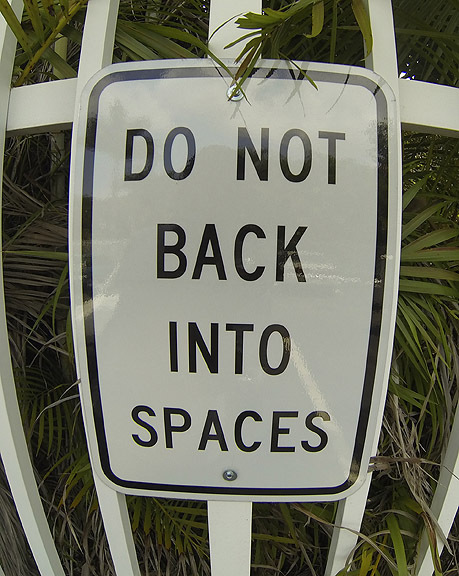 No reverse parking in any space, and vehicle must not protrude from parking space. 13. Motorcycles must park in a parking space. 14. Moving trucks cannot park overnight, no overnight parking in “Service” space or unattended vehicle in “Drop Off/Pick Up” space. It is in your best interest to adhere to community regulations per Association by-laws, and all duly adopted rules pertaining to parking areas. The HOA Board of Directors will not have any info on the reason your vehicle was towed. Kindly direct questions about enforcement to A-Z Parking. Residents are responsible for the conduct of their guest(s), any costs associated with towing are the sole responsibility of the vehicle owner/operator. All violations are documented and photographed. 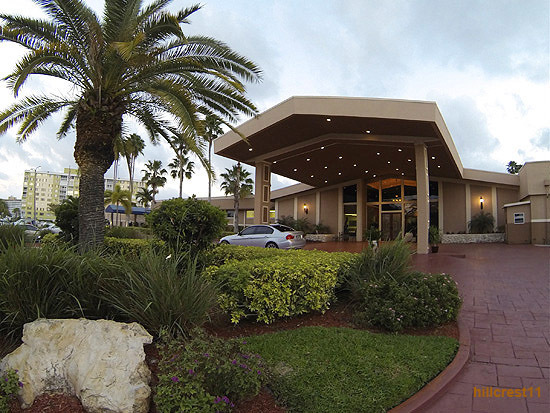 Clubhouse #2 is new meeting location for Hillcrest 11. Quorum was achieved, the vote to waive funding the reserve account by doubling HOA dues for this year was passed. But that reserve will be needed when disaster hits, residents should consider saving up anyway to cushion for when the inevitable hike in HOA dues does arrive. Payment of a special assessment will begin May 1 and paid within 6 months. The assessment will be calculated using 15% and is intended to cover electrical refitting involving the fuse box in each unit. Residents have until April 1st to make final payment on last year’s special assessment. The Board proposed a quote of $15,000 for the electrical refitting task. A resident requested competing quotes. The Board will do the homework as it is expected that major expenses have 3 contractor quotes before a final decision. The sole quote presented is from the electrician who has completed several tasks at Hillcrest 11. A resident on the 3rd floor reported discourteous conduct by some who do not remove their lint after using dryer. And someone is using too much detergent or soap that is not branded with the HE logo. Your money bought this laundry equipment, your money will pay to repair it if we all don’t abide by those guidelines posted in all laundry rooms. If reading English is challenging, just ask someone for assistance, it will save us money in the long run. Or perhaps bilingual signs will become the new normal soon. Residents raised the issue of residents placing litter on the property and not contributing to pick up litter. A resident recounted observing litter remain untouched for two days. We all should chip in to pick up litter that may blow or wash on to Hillcrest 11 or be left by visitors. This helps manage the cleaning expense for common areas. The Board announced all meetings will be in Clubho use #2 (see photo above) and Clubhouse #3 (immediately behind Hillcrest 11) is transitioning to a fitness center (see photo, right). Access to the fitness center is yet to be determined, there will be an annual fee of $52 or more to cover upkeep. Access to the gate to each pool will be changed to electronic access using a wob. Parking permits have been ordered, distribution will be announced. 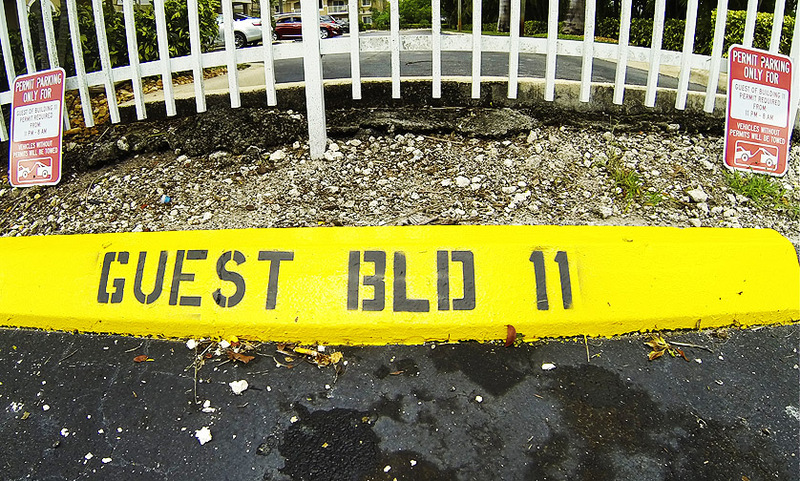 It was emphasized that residents are not allowed to park in guest spaces. Board introduced a new rule: residents with more than 2 cars must arrange to park off-site. A resident with a 2-bedroom unit and sometimes 3 cars expressed outrage. The Board plans to hire a company to monitor the parking courtyard to enforce rules and use of permits. At first, this expense seems excessive for a 42-unit building already on a tight budget, really! The campaign to reduce our water bill is still in play, residents are asked to avoid letting faucets run excessively and to trade-up old toilets. A rebate may still be available from the City of Hollywood. The Board suggests there might be a leak in the main pipe causing our bill to be more than Building #2 which has about 60 units and water bills averaging $2000 per month. To inspect for leaks in the main, water must be shut-off. Will the City reimburse if a leak is found? Stay tuned for update. Insights on pros and cons of the development proposals for Hillcrest were shared and residents were encouraged to visit: HILLCRESTINFORMATION.com and attend an information meeting in Hillcrest Country Club. Read the flyer, click there >> PROS & CONS. 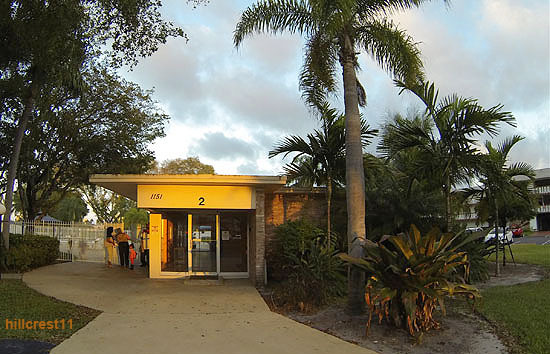 Government ID is required to cast your vote at the Hillcrest Country Club. PLEASE NOTE: IF YOU DO NOT VOTE, YOU ARE IN FACT VOTING FOR THE OLD PLAN. Residents should have received a mailing announcing the process for Election of HOA Board at the Annual Membership Meeting on Monday, April 27, 2015 at 6:30 p.m. in Clubhouse #2 at 1151 S. Hillcrest Court. Anyone interested in volunteering to be a Board Member should submit their candidate information sheet by March 18th. This report was updated March 9th @ 12.45 pm. Previous post stated that residents parking a third car at Hillcrest 11 would be fined. A homeowner who uses the 3rd floor laundry equipment expressed dismay and annoyance with the lack of consideration by residents who leave their laundry inside the washer/dryer unattended long after the cycle is completed. The inconvenience caused is heightened when this happens during the busy weekend peak usage of laundry rooms. 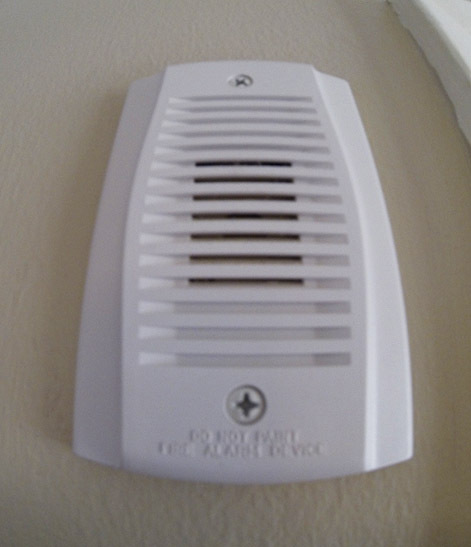 One resident said she sets a stove timer to sound a reminder alarm, others suggest setting an alarm on your phone. The conversation on the topic of laundry room etiquette also touched on people washing mats/rugs and other household items that shed, and leaving paper in pockets and not cleaning up the residue left in our machines. Do not wash mats/rugs in our washing machines, take items that need heavy duty machines to laundromat on Hollywood Blvd near 46th Ave. Remove items from the pockets of your garments. Clean washing machine tub and lint basket on dryer after you use it. Only use detergent that display the HE logo on packaging/container. The dryer cycle is 45 minutes, set an alarm to remind you or leave a basket in laundry room for someone to remove your laundry. A notice was posted on every occupied unit and the community bulletin board by the HOA Board President regarding a change in our late fee assessment. Our bookkeeper will assess a $25 late fee if the full amount due on account is not paid during the current month. For example: If a resident has a past due amount of $50, then mail just their regular monthly payment, the bookkeeper will apply $50 of that towards their old balance, and then post a $25 late fee on the current month as it was not technically paid in full. Previously, the bookkeeper would post $25 to the current month if not received by the grace period and if a unit owner did not pay the late fee, this would remain on the books. The change should encourage residents to pay the full amount due on their account timely. The notice delivered to each unit expressed that payment must be POSTED which means RECEIVED by the 10th of the month. Some residents have been mailing it on the 10th. If the payment is not posted by the 10th, then on the following day, the $25 late fee will be assessed. Our by-laws state the grace period as only five days. This is something we can review in the future. This recurring late fee will begin to be assessed on May 1st. We will review this during the upcoming Budget Meeting. Currently there are five unit owners with a small outstanding balance. Don’t let a mound turn into a mountain, contact the bookkeeper for Hillcrest Bldg. 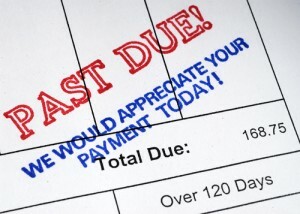 #11 at (954) 983-1221 ASAP to settle your debt and avoid the growing burden and liability of late fees. 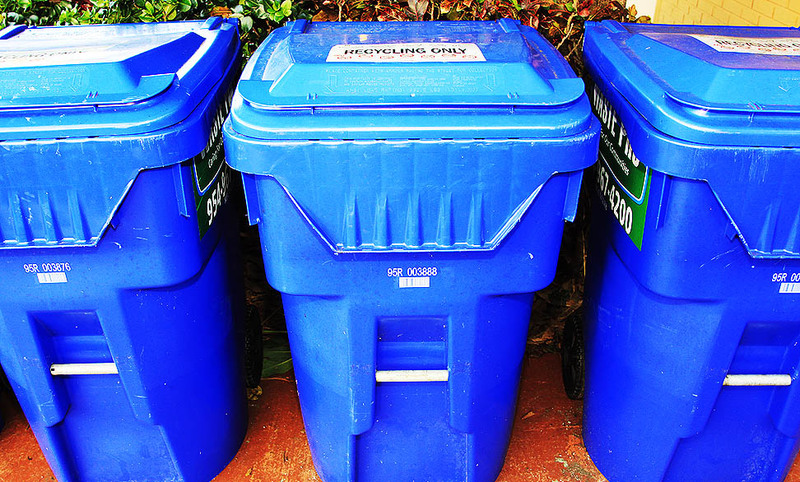 Please Do Not overfill the blue recycle bins. Por favor, no llene demasiado las papeleras de reciclaje azules. Please Do Not place items around the blue recycle bins as these will not be collected and such disposal breaks condo regulations. Por favor, no coloque objetos en las papeleras de reciclaje de color azul ya que estos no serán recogidos y los reglamentos que se rompe de eliminación de condominios. Newspapers should be placed in a plastic bag then placed in the blue recycle bin, this prevents contamination. Los periódicos deben ser colocados en una bolsa de plástico y luego se coloca en la papelera de reciclaje azul, esto evita la contaminación. Please Do Not place items not specified for recycling in the blue recycle bins. Por favor, no ponga objetos no especificados para el reciclaje en las papeleras de reciclaje azules. Do not place recyclables in a plastic bag. No coloque materiales reciclables en una bolsa de plástico.